Alhamdulillah we have entered the first day of the month of Dhul Hijjah. 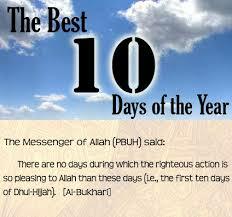 The first ten days of this month are full of rewards and blessings. They happen to coincide with the first 10 days of September. “One of the biggest forms of worshiping Allah Glorified and Exalted be He is to thank Him, deeply, sincerely and continuously. After all, it is He who blessed you with all that you have. In fact, you wouldn’t even be here if it wasn’t for the Mercy of your Creator. So thank Him for ALL that He gave you: the blessing of Islam, the blessing of life and every blessing you possess. Thank Him for the opportunity to experience these ten days. Ask Him for His mercy, forgiveness and guidance. Happy “Best 10 Days for Doing Good Deeds”! May Allah reward you too. Thank you for your comment.